I did not enjoy this book. In fact, I’m not sure how anyone could given the subject matter, but it’s probably one of my favorites of the year. 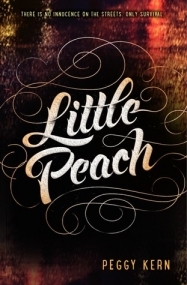 Little Peach is raw and unflinching story of how one girl finds herself knee deep in the world of child prostitution. The subject matter is a heavy one, and Kern does not hold back the reality of Michelle’s, AKA “Little Peach,” world. Little Peach is a 200 page powerful story that with knee your feels right where it counts, make you curl into a ball and cry. Michelle grows up in a troubled home with her grandfather, her primary caregiver and protector. However, when he passes away, she loses all of that and is forced to find her own way. So she decides to go to New York in the hopes that she’ll be able to stay with a friend. When she arrives, her plan falls through and she realizes just how dire her situation is, and is picked up by a seemingly charming and helpful boy named Devon. Desperate, vulnerable with nowhere else to turn, Michelle accepts his help and is swept into a world of drug addiction and prostitution. Devon, her “daddy,” establishes himself as a new provider and protector of Michelle and the other two girls who reside with him: Baby and Kat. With promises of love and a new family, Michelle accepts her lot in life and becomes “Little Peach,” believing this is the best that’s out there for her. When your mother is a drug addict who chooses her slimy boyfriend over you, there aren’t many options. Still, there are times when she regrets her new life, especially when she sees the mistreatment of the other girls and the horrors of her “family.” Then there are times when she fleetingly finds peace and happiness: When she, Baby and Kat are “off duty” and enjoying a fun day. You can tell she longs for a normal life, one any girl should have, but the realities of her life continue to creep back night after night in the form of getting high and hotel rooms. It’s a sharp contrast as she battles to hold onto her childhood during the day, while slipping on her adult personality every night along with the dresses Devon makes her wear. Michelle’s voice is strong, broken and raw all at once as her narration flips between the story of how she became Devon’s Little Peach and chapters told from a hospital bed, wanting to reach out to the social worker assigned to her case. The former displays a voice of innocence lost as Michelle tells of her time not only with Devon, but also with her grandfather. While the latter feels sharper and harder, more distant and tougher thanks to many of the horrible things she’s encountered. It made me want to hug her and take all her pain away. Kern captures all of Michelle’s longing, desperation, hopelessness and sadness perfectly. She creates a voice that can’t be ignored or forgotten, one that begs us to for help and demands our attention, leaving the reader horrified, fascinated and disgusted all at once. The worst part of Little Peach is that everything thing in the book is real. There are no happy endings, no easy answers or closures. This is real life. And that’s a hard pill to swallow to think that this is happening right now, even as you read this review. This book left me an angry, weeping mess and I know it won’t ever leave me. Recommended for fans of Ellen Hopkins and Christa Desir’s Fault Line and Bleed Like Me. **If you are interested in learning more about human trafficking and what you can do, National Human Trafficking Resource Center is a great place to start.